Pinnon Hatch Farms LLC Visit Our Store! 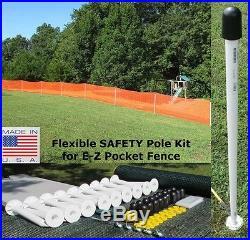 USA E-Z Pocket Fence Pole Kit. Made in the U. 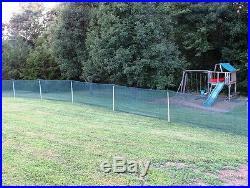 View All Our Outfield Fences!! The original flexible safety fence! The safest fence in the world. The company patented this system 26 years ago, & has been making & perfecting these fences since that time. They are made in the U. Perfect for all levels of play. Made from high performance materials that are weather resistant and UV protected to offer many years of trouble free use. Durable enough for the most demanding tournaments, yet very economical for those tight budgets. Attractive, easy to set up and portable design will be a home run for any program! Are used for temporary installation. Ideal if fencing needs to be removed or replaced often. Each ground sleeve measures 12 and includes a yellow debris plug. Auger Bit 1pc Auger bit is included with each kit. It goes in your electric or battery powered drill. Don’t crowd it or it screws into the ground. Don’t push it. It will dig into the hardest soils & you will have a pilot hole for the ground insert in a minute or two. 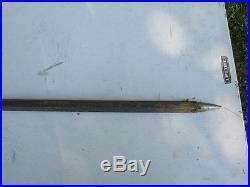 Ground Sleeve Installation Tool 1pc. Is included with each kit. 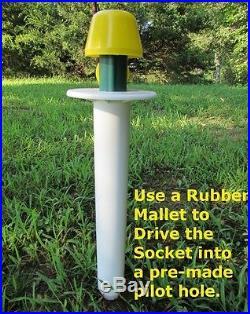 Put it in the ground sleeve & use a rubber mallet to drive sleeve into the pre-drilled pilot hole. 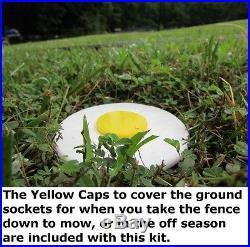 Yellow Caps 1 yellow cap is included with each ground insert. When you take the fence down in the off season, or you can take it down to mow & throw it to the side, then quickly put it back up. These yellow caps snap into the hole. The 50′ Pocket Fence comes with 6 Black Caps, 100′ 12 pcs caps, 150′ 18 pcs caps. We also sell the black caps separately. NOT INCLUDED with this listing. Each package includes the following. 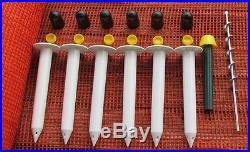 Ground Sleeves & Yellow Cap 6 pcs. 24 pcs, 30 pcs. You select the quantity above. Ground sleeve installation tool. I have several pictures above. The outside(end) posts will tend to pull in some, since for safety reasons they are flexible. Angle them out slightly when installing. Also if you want them to be more stiff, you can cut a 10′ pc. Of 1/2 electrical conduit in half & insert them inside of the 2 outside poles. They are hollow so they fit right in. If you live in a very windy area. You will want to cable tie the fence at the bottom of the pole, or stake it down in a few areas. Use an auger bit in your cordless drill, or a 6′ bar (pictured above), to make a pilot hole before tapping in the ground sleeve. You are going to love this! Instead of weed-eating around this fence, pull it up, throw it to the side, mow where it was, and put it right back up in a few minutes time. 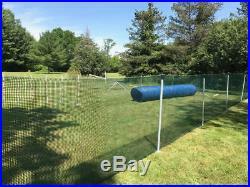 Sports Outfield Fence for baseball, softball, volleyball, wiffleball, soccer, Lacrosse, basketball, etc. I listed basketball because when I was young, we played basketball with a rim nailed to a tree on top of a hill. 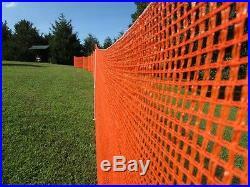 I needed one of these fences so I didn’t have to run down the hill chasing the basketball. Children’s Play area. Pond or Lagoon Fence. Thanks for considering Pinnon Hatch Farms LLC / Jones-Sports for your farms supply needs. Feedback: I finally put my fence up! 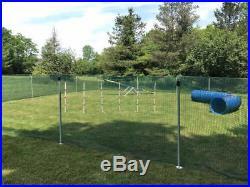 I bought your temporary system to inclose an area to practice agility with my dogs! I have photos if you want them! What is the possibility of getting one or two more spikes? I forgot to make a gate! And I have an idea! Now I can just move the fence to mow! I took it all down and put it back up to mow last week! Once I had a system it was easy! International Buyers Please Note. These charges are the buyers responsibility. We do not mark merchandise values below value or mark items as gifts US and International government regulations prohibit such behavior. 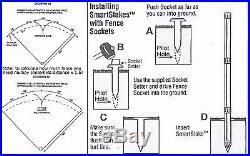 The item “E-Z Pocket Fence 4′ T Safety Flexpole Kit Snow Garden Baseball Outfield Fence” is in sale since Sunday, September 4, 2016. This item is in the category “Home & Garden\Yard, Garden & Outdoor Living\Garden Structures & Shade\Other Structures & Shade”. The seller is “brucejones” and is located in Centralia, Missouri. This item can be shipped to United States.